Join us for two days of fun. 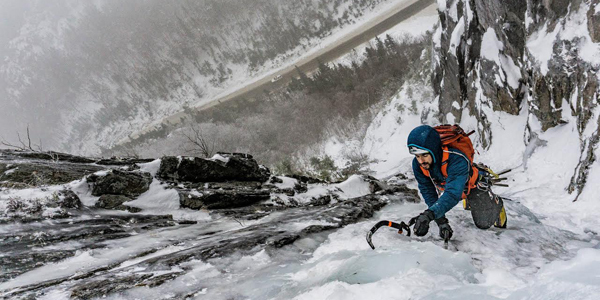 Buy one, Get One Free on a Mountaineering Skills Course + Mount Washington Ascent OR 2 Days of Ice Climbing. On day one we will introduce you to ice climbing, using a safe top-rope system. We will teach you how to belay, and proper climbing techniques. If you can demonstrate that you have a solid understanding of these skills plus how to belay a leader, we will move on to multi-pitch. On day two your NEM guide will take you on an ice route that best fits your skill and comfort level. This can range from a one-pitch lead/follow scenario, or a multi-pitch climb on one of our world class cliffs in the area. This course is ideal for all ages and skills levels from beginner to advanced. We cater the course to you! No prior experience is required. Use promo code "happyholidays" at checkout. This adventure is about climbing and that is what we will do. Along the way, we will help brush up on skills and coach you toward more effective and efficient climbing practices. Most of the required equipment [listed below] is available for rent from our affiliate mtnGEAR. NEM climbers will receive an exclusive discount of 20% discount on all rental equipment and clothing. [ ] Ball Hat/Sun Hat: Optional. A lightweight ball cap or sun hat. [ ] Insulated Parka: This item becomes of highest importance when we are faced with poor weather. This should be an expeditionary-type heavy parka that extends well below the waist and above the knees. Goose down is recommended versus synthetic fill. It does not have to be waterproof, but that is a nice feature. The parka is worn primarily at rest breaks on summit day and as an emergency garment if needed. When sizing a parka, allow for several layers to be worn underneath; buy it large. The parka must have an insulated hood. 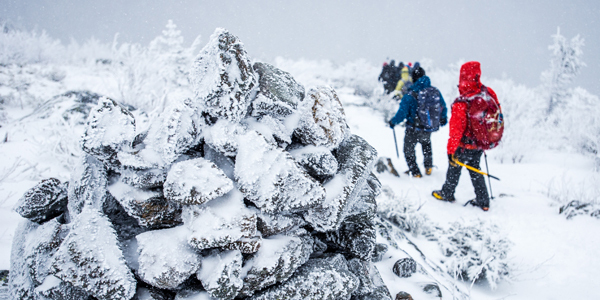 Spend the first day of two learning the necessary mountaineering skills to tackle Mount Washington on day two. This is the big one - the tallest mountain in the Northeast! Mt. Washington towers over its neighbors at an elevation of 6,288ft. It is known for erratic weather and extremely strong winds. A winter climb of Mt. Washington is a serious undertaking. Participants can expect an 8-10 hour climb up the Winter Lion Head Trail or one of the many other routes that lead to the summit - with a large portion of the day above tree line. Participants should be prepared, in good physical shape with prior hiking experience. If you aren't currently familiar, we will teach and then demonstrate the following skills to you during the climb. We work hard to ensure your safety. [ ]Hard Shell Jacket with Hood: Wind/rain Proof. Gore-Tex recommended.